Taxes and the Labor “Discount”: What Could Go Wrong? A supposed labor market distortion that I’d never considered is that government receives a “discount” on labor services because public employees’ income tax liability is returned to the very government coffers from which they are paid. Tyler Cowen regards this as a “wacky” idea, but not easy to refute. Suppose the income tax rate is 20%. If the government pays a worker $10, then $2 is returned to that same government via the tax. The net cost to government is just $8. But a tax “discount” on cost is not unique to government, though the form it takes may differ. Who Gets a Labor “Discount”? Does it cost a private employer more than government to pay a worker $10? It depends on the situation. Maybe more, maybe less. If the private employer pays the same 20% tax rate on its profits, the wage payment creates a tax deduction worth $2 in avoided tax. The net cost is $8, so there is no difference. However, a firm must be profitable to get that deduction, so unprofitable startups, strugglers, and nonprofits do not get the same wage “discount” as government. Of course, losses can be carried forward to reduce taxes if the firm ever becomes profitable, and non-profits have tax advantages of their own. The value of the tax deduction (the private “discount”) depends on the tax rate paid by the firm. A profitable C corporation with a marginal tax rate of 35% (under current law) gets a steeper discount than a small businessperson in the 28% tax bracket. To some extent, a steeper discount subsidizes the cost of hiring employees who are highly compensated. A highly successful pass-through entity like a sole proprietorship, partnership or S corporation can face the highest individual marginal rates, so the “discount” for such a firm could be the largest relative to wages. There are a couple of potential distortions involved here: one is the standard wedge driven between the value of workers’ marginal product and the after-tax wage they receive. This discourages labor supply. There is a second distortion to the extent that the “discount” gives government and profitable firms an artificial competitive advantage of over unprofitable buyers of labor services. Furthermore, the loss of the labor discount for firms falling into unprofitable positions imparts an undesirable procyclical element into the tax system, potentially aggravating episodes of under-production and high unemployment. The government’s labor “discount” may reduce the available supply of labor to the private sector. Government does not operate under the profit motive, and unlike private firms, it need not concern itself with efficiency standards for survival. Government production does not face a market test, so it is difficult to measure worker productivity, which is the key to the efficient pricing and use of labor in the private sector. The penalty to government for paying an above-market wage is zero. The same “discount” argument can be made for government contracts with private firms. The profits earned on those contracts are taxed by the government payer, so the total cost to the government is essentially discounted. Contracts between private firms are on the same footing if the payer is profitable, since the paying firm can deduct its costs from taxable profits. A payer that is not profitable is at a disadvantage. The government “discount” might not be the primary reason to suspect that government contracting is subject to distortion and inflated values, but it is a reason nevertheless. One could be forgiven for thinking that the “discount” creates additional leeway for graft! Does the government labor “discount” really impinge on the federal agency budget process? I doubt that anyone having a critical role in the Congressional or executive budget process thinks much about it, to say nothing of agency hiring and compensation managers. Yet spending levels may “bake-in” a certain amount of over-payment of wages or fat in government contracts. In any case, historically, federal spending has not been tightly constrained by the flow of tax revenue. There is empirical evidence on government vs. private wages. These data are of interest in their own right, but since so much of the private sector receives the same tax “discount” as government, it’s not clear that it should cause much if any differential in pay. The Congressional Budget Office (CBO) compared differences in compensation from 2005-2010 and again from 2011-2015 and found that federal wages and benefits exceeded private sector wages and benefits over both periods. The gap decreased with increases in education. For workers with a bachelor’s degree or less (71% of the CBO’s latest federal workforce sample), the gap was substantial. The difference was just a few thousand dollars for those with a master’s degree. The professional degree/Ph.D. category stood in fairly sharp contrast to the others, with private workers having a fairly large advantage. It is possible that the most highly-educated category, being the most scarce and probably the most specialized, has unique market characteristics. It should also be noted that the sample of federal workers was about 4 years older, on average, than the private sector sample, which might have skewed the results. 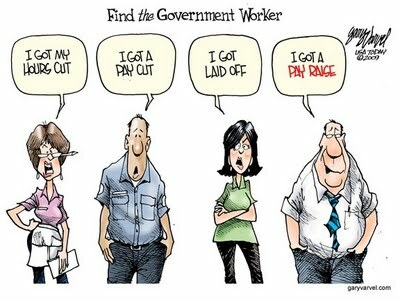 The CATO Institute used data from the U.S. Bureau of Economic Analysis (BEA) and found that federal civilian workers earned 80% more than private sector workers in 2016. The CATO report cites several other studies, including the CBO’s, which consistently find that federal workers earn more. This could be partly attributable to the government labor discount, bureaucratic laxity, the heavy unionization of the federal work force, and even the geographical distribution of federal workers. The worst aspect of the tax “discount” on federal and many private-sector wage payments is the taxation itself. However, the fact that some firms and organizations don’t qualify for the discount represents a significant distortion. To some extent, labor input is discouraged for unprofitable startup firms, firms struggling for survival, and of course the non-profit sector. These organizations are at a distinct disadvantage in terms of resource allocation relative to those who qualify for the “discount”. Nevertheless, this unevenly applied discount may be an unfortunate mathematical implication of a public sector with income-taxing and spending powers. The discount on wages and contract payments provides additional margin along which government can be wasteful. A partial solution is to maintain whatever firewalls exist between taxing and spending authorities, but that won’t unwind past distortions. Of course, the best solution is to shrink government: reduce taxes and reduce the federal role in everything from infrastructure to public health, dismantle the administrative state, and reduce military spending. I didn’t really need another reason to warn of the dangers of big government, but count this one as duly noted! The GOP tax reform bill passed by the House of Representatives last week contains a reduced tax rate for “pass-through” business income. The discussion of this provision in my post of November 9 was accurate as far as it went, with one qualification: the highest marginal federal tax rate on pass-through profit income would be 25% under the bill, down from 39.6% currently. However, the bill contains complex rules for defining pass-through profit that qualifies for the lower rate, and my earlier treatment was woefully inadequate with regard to those rules. The House bill seeks to address concerns that owners of personal-service businesses would be tempted to classify an “excessive” share of their income as profit rather than wages and salary. Profit would qualify for the new rate, but the wages and salary paid to the owner would not. Currently, all pass-through income is treated the same. Therefore, “safeguards” were inserted in the bill to prevent the presumed “abuse” that could occur under the bill (or see here or here). First, pass-throughs would be subject to a 70/30 rule: 70% of pass-through income would be treated as wage and salary payments; 30% would be treated as profit. That’s the simplest option. But it means that the true marginal rate on a dollar of income for an owner in the top bracket would be roughly 35.2% (0.7×39.6% + 0.3×25%). That’s much less favorable than my earlier post implied. It’s also less favorable than the corporate rate cut. Alternatively, a business owner could use a schedule based on invested capital to determine a percentage of income qualifying for the 25% rate. This might benefit a physician invested in costly medical equipment, for example. However, other personal-service businesses are specifically assigned a percentage of zero. This list includes accountants, lawyers, financial advisors, and performers. Imagine that: the House approved a benefit for which lawyers cannot not qualify!! Another important point is that many small businesses people do not earn enough to benefit from the 25% pass-through rate. Yes, they would see reductions in their marginal rates in lower brackets (and there would be fewer brackets), but in some cases the loss of deductions for items like state and local taxes would be more than offsetting. So it’s not clear how many pass-through business owners would actually benefit from the plan. 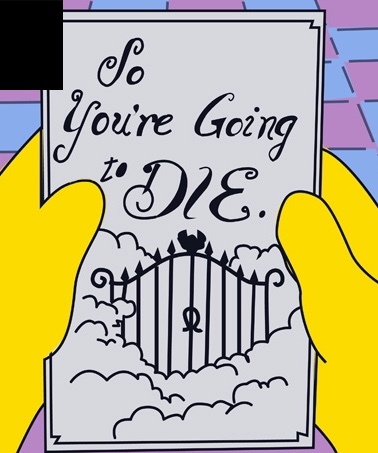 The Senate bill takes an entirely different approach. It reduces tax rates in lower brackets, but it would also allow pass-throughs to deduct a flat 17.4% from taxable income, effectively reducing the top marginal rate from 39.6% to 32.7%. Effective rates in all lower brackets would be reduced by the same percentage. There is no distinction in the Senate bill between wage and salary payments versus profits. The post linked in the first paragraph left the impression that the House tax bill offered more relief for small businesses than the Senate bill, and that’s probably not true, at least for the most successful small businesses. However, the National Federation of Independent Business estimates that at least 85% of small business would not qualify for the 25% rate. Some businesses won’t qualify simply because they are too small to pay a rate exceeding 25%. And when a business qualifies, only 30% of its income will qualify for the reduced rate. Other pass-through businesses won’t qualify due to the nature of their services, another example of different tax treatment of different sources of income. The rules governing qualification for the 25% rate are distortionary and are hardly a simplification. The Senate bill, on the whole, probably does more for small business owners in lower brackets and probably many in higher brackets as well. The rat’s nest that is the federal income tax code is a testament to the counter-productive nature of central economic planning. Not only does the tax code force citizens to waste time and other resources on compliance activities. It also encourages us to direct resources into uses that would not be worthwhile in the absence of tax incentives, uses that are not worthwhile in a societal context. A general rationale for many provisions of the tax code is that they serve some “worthwhile” public purpose. A special tax provision is created to subsidize activities contributing to that purpose. Since that reduces the flow of revenue, tax rates must increase as an offset. However, high tax rates are damaging to economic health in and of themselves. They blunt incentives and drive wedges between the values and rewards that guide all economic decisions. Defenders of this deduction note peremptorily that it is used by taxpayers in all fifty states, as if that should come as a surprise. Well of course it is! And those who are taxed most heavily benefit the most from this deduction, and those benefits are most concentrated in high-tax states. The House GOP bill would limit the SALT deduction to $10,000, while the Senate version would eliminate it entirely. Mortgage Interest (MI) Deduction: Long ago, the idea took hold that ownership of a home was of greater inherent value than mere occupancy. It’s obviously true that owners have greater rights than renters over use of a property. Those benefits are internalized, and owner-occupants might well be more inclined than renters to take pride in, care for, and improve a property. That suggests a social or external benefit from home ownership, one that at least benefits others in the vicinity of a given property. This deduction has fostered a massive over-investment in housing relative to other assets and forms of consumption. The House tax bill would allow a deduction on interest payments for up to $500,000 of mortgage debt, but this limit would apply only to new mortgages. The Senate bill would not alter the deduction in any way. These steps are severely limited in their reform ambitions. Medical Expense Deduction: To take this deduction, you must 1) be an itemizer; and 2) have eligible medical expenses exceeding 10% of adjusted gross income (AGI). Then, you can deduct only the excess above 10%. A relatively small percentage of taxpayers actually take this deduction, mostly wealthy, older individuals or couples. It can be argued that the deduction encourages overuse of medical resources in some cases, but there are certainly others in which it provides relief from the hardship of an illness requiring expensive care. On the other hand, the deduction might serve to discourage the purchase of supplemental Medicare coverage by individuals who can afford it but are willing to bet that they won’t need it. Part of that bet is covered by the deduction. The House bill would repeal this deduction in its entirety. The Senate bill would leave it untouched. Student Loan Interest Deduction: Currently, up to $2,500 of student loan interest can be deducted “above the line” by non-itemizers, but only if their AGI is within certain limits. Higher education is often claimed to have social (external) benefits. To some extent, the student loan interest deduction helps bring the cost of an eduction to within reach of a broader swath of the citizenry. These considerations provide the rationale for public subsidies for funding tuition and other costs with debt. The tax deduction is only one of many forms of education subsidies. Another is provided by the below-market rates at which students are able to borrow from the federal government. The social benefits of higher education are strongly associated with the value it adds for the individual. It can be argued that as a society, we may have pushed college education well beyond that point. A large number of indebted students decide, too late, that continued enrollment has little value, so they drop out and often default on their federally-subsidized debt. Moreover, these loan subsidies stimulate the demand for college education, which leads to a certain amount of escalation in tuition and fees. These ill effects make elimination of this deduction a tempting way to broaden the income-tax base, enabling a reduction in tax rates. The House bill eliminates the deduction for student loan interest, but the Senate bill leaves it intact. Conclusion: There are plenty of shortcomings in both the House and Senate versions of tax reform. Three liberalizing goals of reform are tax simplification, elimination of provisions that benefit special interests, and of course lower rates. 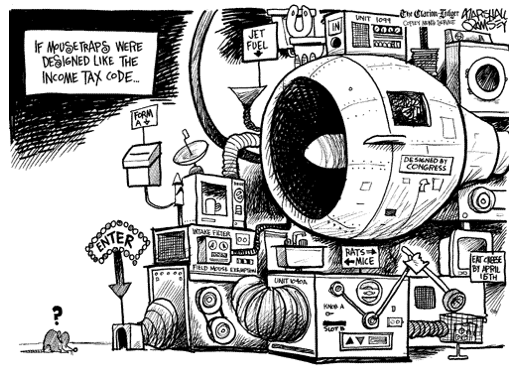 Most of the complexities in the tax code benefit special interests in one way or another. The deductions discussed above fall into that category and necessitate higher tax rates on personal income. That in turn makes the deductions more valuable to those who claim them. In terms of the liberalizing goals of reform, the House tax bill is wider ranging than the Senate version, though the Senate bill’s complete elimination of the SALT deduction is better. Happy Hour With Nanny: Cancer Cocktail or Cardio Cooler? Last week brought news that even moderate alcohol consumption can increase your risk of cancer. I heard it over and over, so it must be true! A report from the American Society of Clinical Oncology (ASCO) cites research findings of elevated risk of several types of cancer for drinkers, especially for heavy drinkers. It’s good to be aware of those associations, but drinking alcohol responsibly confers certain benefits that are more than compensatory. I won’t change my drinking habits on account of ASCO’s statement, and the findings in the report do not justify some of ASCO’s public policy recommendations. And evidently, as Bailey notes, there may be positive social and economic advantages associated with a bit of tippling. Oh, please, calm down! Yes, there are risks to boozing, the most dangerous of which are well known. As Carroll emphasizes, ASCO’s statement doesn’t change the calculus much. There are few risks presented by moderate enjoyment of adult beverages, and the benefits are compelling. Please keep the nanny state out of my liquor cabinet! Update: In writing the following post, I neglected to devote sufficient attention to the rules that would govern taxation of pass-through income under the House GOP tax plan. Those rules significantly alter some of the conclusions below. Those rules are discussed in a later post: Stumbling Through Pass-Through Tax Reform. Double taxation of corporate income is a feature of the U.S. income tax code that is partially addressed in the tax reform bill proposed by the House GOP. Corporate income is taxed to the firm and again to owners on their receipt of dividends or when a company’s growth results in capital gains. Ultimately, the total rate of taxation matters more than whether it is implemented as single or double taxation of income flows. However, there is an unfortunate tendency to view corporate taxes as if they are levied on entitites wholly separate from their owners, so double taxation carries a stench of politically sneakiness. It also creates multiple distortions in the decisions of investors and the separately managed firms they own. Non-corporate income taxation is reduced by the House plan even more substantially than the cut in taxes on corporate-derived income. However, the plan does not reduce taxes on high-earning professionals, many of whom are situated similarly to successful business owners and investors from an economic perspective. The federal corporate tax is not borne 100% by shareholders, as discussed in the previous post on Sacred Cow Chips. Some part of the burden is borne by labor via reduced wages. It is difficult to correct for this distortion in terms of calculating an effective marginal tax rate on corporate income. For example, suppose a new 35% tax would reduce corporate income from $100 to $65. The firm finds, however, that it can reduce wage payments by half of the expected tax payment, or $17.50. The firm would now earn $117.50 before tax and $76.38 after tax. Relative to the new level of pre-tax income, the tax rate is still 35%. It is no less than that by way of the reduction in wages, though the impact on the firm’s pre-tax income is mitigated. The discussion here of tax rates, and even double taxation, is not intended as commentary on tax fairness. It might or might not be fair that the burden of the tax is shared with labor. Instead, the issue is the magnitude of the economic distortions caused by taxes. Tax rates themselves are a reasonable starting point for such a discussion, and they are easy to measure. Lower tax rates beget fewer distortions in economic outcomes than high tax rates. Low rates provide greater incentives to save and invest in productive assets, which enhances labor productivity, wages, and economic growth. Indeed, businesses go to great lengths to avoid taxes altogether, if possible, but typically those are non-productive uses of resources, which demonstrates the very distortions at issue. Under current law, the top personal income tax rate on dividends is 20%. It is 23.8% if we include the Obamacare surtax. Adding that to the corporate rate yields the effective top tax rate paid by shareholders: 23.8% + 35% = 58.8%. The GOP bill does not alter the 23.8% top rate on dividends or capitals gains. By virtue of the corporate tax reduction, however, the plan would reduce the overall top rate on shareholders to 23.8% + 20% = 43.8%. In addition, the House plan rewards the owners of pass-through businesses relative to individuals earning high levels of wage and salary income. If anything, the bill would penalize these individuals. For example, while the owner of a high-earning pass-through would face a 25% tax rate, a high-earning professional or corporate employee would pay the top marginal rate (39.6%) plus the surtax (3.8%) and possibly the bubble tax (6%). This is one reason why Scott Sumner says it looks as if the House plan was designed by Bernie Sanders! The tax system should be neutral across different sources of income. Divergent effective tax rates on owners of corporations, pass-throughs, and high wage-earning individuals is undesirable and introduces arbitrary elements into private decision-making. If anything, the House GOP tax plan exacerbates those differences. By cutting marginal tax rates, it would reduce the magnitude of business tax distortions both for corporate and pass-through organizations and their owners, but the relative advantage of pass-throughs would increase relative to corporations, and owners of corporations and pass-throughs benefit relative to high-earning individuals. Let’s hope this is fixed as the bill evolves, but more balanced reductions in rates would require higher rates on business owners than contemplated in the current plan. As expected, a reduction of the corporate income tax rate from 35% to 20% is included in the GOP’s tax reform bill, a summary of which was released today. That rate cut would be a welcome development for workers, consumers, and corporate shareholders. It should be no surprise that the burden of the U.S. corporate income tax is not borne exclusively by owners of capital. In fact, it might hurt workers and consumers substantially while imposing relatively little burden on shareholders. In fact, owners of capital can get out of the way. Capital is very mobile relative to labor. Here’s a counterfactual exercise Cochrane steps through in order to illustrate the implications of ownership bearing the incidence of the tax: if equity markets are efficient, share prices reflect all available information about the firm. If wages and product prices are unchanged after the imposition of the tax, then shareholders would suffer an immediate loss. Once the tax is discounted into share prices, there would be no further impact on current or future shareholders. Thus, future buyers of shares would escape the tax burden entirely. As a first approximation, the share price must fall to the point at which the ongoing return on the stock is restored to its value prior to imposition of the tax. Cochrane’s post and another on his blog were prompted by an earlier piece by Greg Mankiw showing that real wages, in an open economy, will have a strong negative response to a corporate tax increase. Here is the reasoning: the tax reduces the return earned from invested capital in the short run. Ideally, capital is deployed only up to the point at which its return no longer exceeds the opportunity cost needed to attract it. Given time to adjust, less capital must be deployed after the imposition of the tax in order to force the return on a marginal unit of capital back up to the given opportunity cost. That means less capital deployed per worker, and that, in turn, reduces labor productivity and wages. Another issue addressed by Cochrane has to do with assertions that monopoly power in the corporate sector is a good rationale for a high tax on corporate income. You can easily convince me that the “average” firm in the corporate sector earns a positive margin over marginal cost. However, a microeconomic analysis of monopoly behavior by the entire corporate sector would be awkward, to say the least. Despite all that, Cochrane notes that monopolists have more power than firms in competitive sectors to raise prices, and monopsonists have more power to reduce wages. Therefore, the “tax the monopolists” line of argument does not suggest that labor will avoid a significant burden of a corporate tax. A safer bet is that firms in the U.S. corporate sector are price-takers in capital markets, but to some degree may be price-makers in product and labor markets. Cochrane also emphasizes the inefficiency of the corporate tax as a redistributional mechanism, even if shareholders bear a significant share of its burden. It is still likely to harm workers via lost productivity, as discussed above. It is also true that many workers hold corporate equities in their retirement funds, so a corporate tax harms them directly in their dual role as owners of capital. The cut in the corporate tax rate is but one element of many in the GOP bill, but a related provision is that so-called “pass-through” income, of the type earned via many privately-owned businesses, would be taxed at a maximum rate of 25%. These businesses generate more income than C-corporations. Currently, pass-through income is taxed as ordinary income, so capping the top rate at 25% represents a very large tax cut. As Alex Tabarrok points out at the last link, tax treatment should be neutral with respect to the form of business organization, but under the GOP bill, the effective gap between the top rate for pass-throughs versus corporate income would be even larger than it is now. Critics of a reduction in corporate taxes should bear in mind that its incidence falls at least partly on labor, perhaps mainly on labor. The U.S. has the highest corporate tax rate in the industrialized world. That undermines U.S. competitiveness, as does the complexity of corporate tax rules. Tax planning and compliance burn up massive resources while drastically reducing the tax “take”, i.e., the revenue actually collected. The corporate income tax is something of a “show” tax that exists to appease populist and leftist elements in the electorate who consistently fail to recognize the unexpectedly nasty consequences of their own advocacy.